Assorted flowers arranged amongst Emerald Palm Fronds and Lush Greens on a wire easel to create a stunning display of warm affection that will last in the hearts of friends and family for years to come. 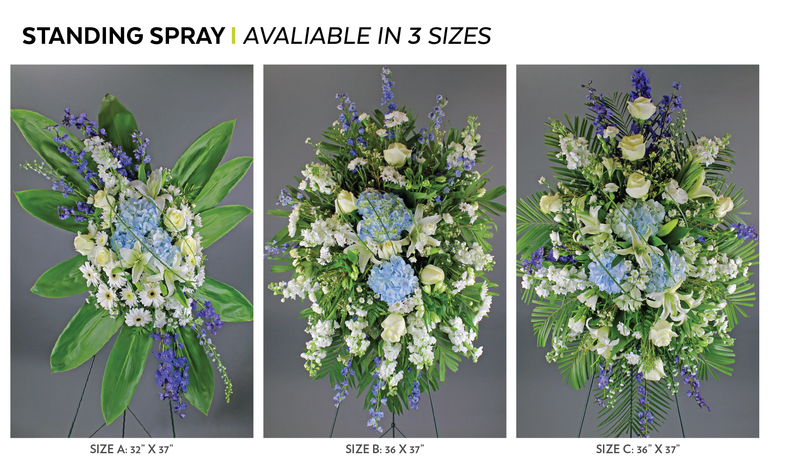 I had to order an arrangement very last minute for a funeral service. Erica from Field of Flowers was beyond courteous, made a call on my behalf, and found out where the flowers should be delivered. While the circumstances were sad, I definitely will use Field of Flowers again! The flowers exceeded my expectations, by far! The Azure Standing Spray flowers, literally took my breath away when I saw them. They were stunning and were far more beautiful in person, than what is depicted on the website. I was happy with the flowers and how it all looked. It was a bit small and only one issue was the transfer from the funeral home to the church to the cemetery, it was not tied on good and about fell to the floor from the wire holder in front of everyone. Then it looked ruined because it was hanging.